Today i will show how to SSH Service enable or disable in Huawei OLT. When you need to disable or enable the network service ports such as the DBWIN, ntp, radius, snmp, SSH, Telnet and Trace in the system, run below command. After the command is executed successfully, the monitoring task of the corresponding port is disabled or enabled. dbwin Indicates the DBWIN service. dhcp-relay Indicates the DHCP relay service. dhcpv6-relay Indicates the DHCPv6 relay service. ntp6 Indicates the Ntp IPv6 net service. ntp Indicates the NTP service. radius Indicates the radius service. snmp Indicates the SNMP service. ssh-tl1 Indicates the SSH service of TL1. ssh Indicates the SSH service. telnet-proxy Indicates the telnet proxy service. telnet-tl1 Indicates the telnet service of TL1. telnet Indicates the telnet service. 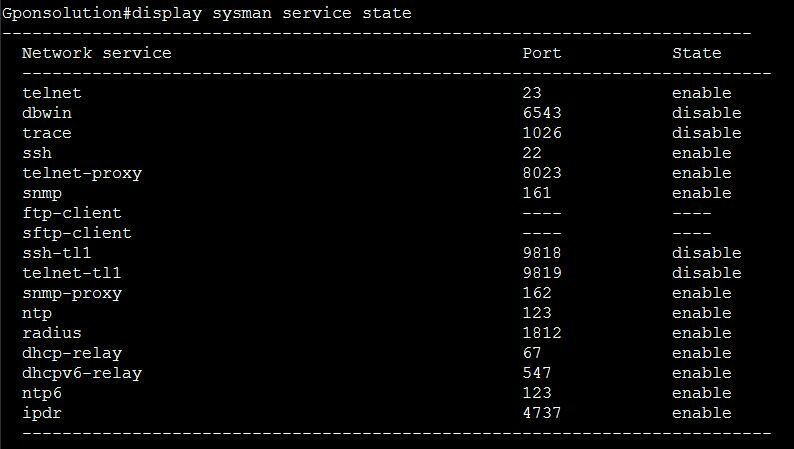 port portid Indicates the portid used by telnet service. trace Indicates the trace service. enable Enables the network service ports. When you need to enable the network service ports, use this parameter. disable Disables the network service ports. When you need to disable the network service ports, use this parameter. After a network service port is disabled, the user on the port is forced to go offline. By default, only the DBWIN, TRACE, SSH-TL1, and TELNET-TL1 network service are disabled.